Build the bike lanes, and they will be used! What happens when you build safe bicycle infrastructure that connects so people can get where they want to go? An explosion in the number of cyclists. See what is happening in New York City, which has created 200 miles of bike routes in the last three years. Here’s a fun fact: Philadelphia has the highest percentage of people who bike to work of any really large U.S. city – with New York ranked sixth – according to the 2008 American Community Survey. Comments Off on Build the bike lanes, and they will be used! Think of the East Coast Greenway as an urban Appalachian Trail connecting cities from Maine to Florida. 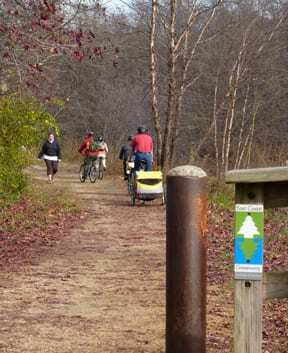 It goes along West Windsor on the D&R Canal towpath (ask us for a free map of the NJ route), with the potential for plenty of money to come to area businesses from bicycle tourists. The Greenway wants to get most of the route off the roads, making it more appealing for cyclists and walkers. Many areas need work, including points not too far south from us. 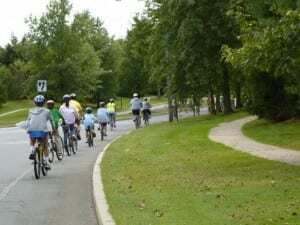 The Greenway says: “ It is time for Philadelphia to fill the gaps in the Schuylkill River Trail, for Pennsylvania to have a connected East Coast Greenway connecting to New Jersey and Delaware, and for Camden, New Jersey to become a city of trails, not highways. The Greenway asks that people contact the governor to stress their support for the project. You can also write to Office of the Governor, P.O. Box 001, Trenton, NJ 08625, or call 609-292-6000. Read how a trail in Pennsylvania benefited local businesses. 1. Spend more money on making walking safer. 2. Provide good places to walk. 4. Lower and enforce urban speeds. 5. 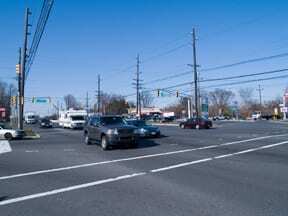 Stiffen penalties for motorists who violate the rights of pedestrians crossing legally. The WWPA wrote a letter on November 10, 2009 to the township council and the mayor requesting a roundabout design for Old Bear Brook and Bear Brook Roads that will be accessible to bicyclists not comfortable riding in traffic. The WWBPA wrote follow-up letters, before and after a public hearing on November 23, 2009, advocating changes in design.